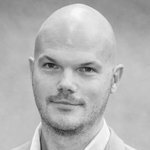 Today’s post is part 2 of a series of 3, adapted from the presentation given by international keynote speaker Travis Wright, Marketing Technology Entrepreneur, Data & Analytics Geek, Media Think Labs (US). 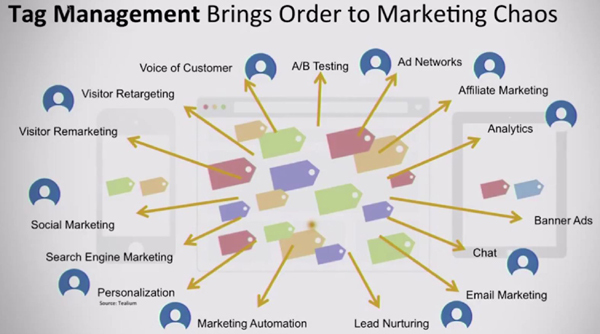 How would you build your own marketing stack? 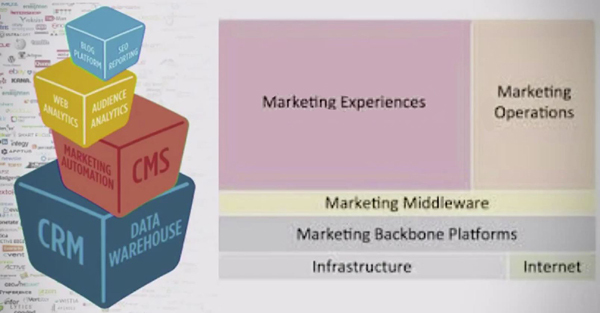 Well, this is what your marketing stack would look like. You’re going to need to have some different things, the marketing automation, CMS. You’re going to need to have a data warehouse, data management. Here are the main pieces. You have your marketing experiences, your marketing operations. You have your marketing middleware, technologies, and your marketing backbone platforms, and then your infrastructure. Now if you look at that marketing landscape, that’s where that’s pulled from. Those are all the different sections of that marketing technology landscape so you can see all the different tools that are located in that. When I say, “We want to build our own tool, our own marketing cloud,” this is how you do it. You say, “Well, you know what? I really like Omniture and I like Test & Target, so I want to use that. I like BlueKai, I think BlueKai is good and I really like Silverpop that have bought, I’d want to use that. Buddy Media is pretty solid and ExactTarget is great. I want to use a few over here on the marketing cloud.” Well, that’s what you can do if you build yourself a tag management system. From my estimation, building your own marketing cloud through a tag management system is the most effective way for you to stay on top of it and be future-proof. If you buy a cloud, there’s a chance that they could say, “Hey, thanks for all this data you’ve given us overtime. For you to completely access this or for you to get a copy of this, we’re going to have to increase your licensing fee.” You can see that different things could potentially happen over that, so you really want to stay future-proof with the tag management system. It’s the best Frankenstein, it’s one you can love, it’s one you build. It’s great. 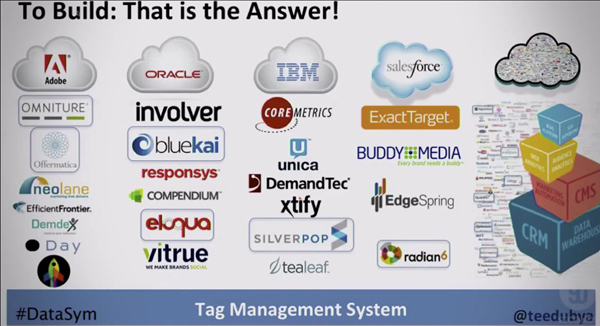 Tag management really brings order to the chaos of all these tags, and all these technologies that are on your site. Because if you say, “Hey, I want to try that technology. That one, that one, that one” and you put it on your site, well then, your load time increases, it becomes slower, and maybe you don’t put all the tags in all the right places on all of your 100,000 pages. All these different technologies that are out there, all these tags that are on your website… Boom! You can put them through a tag management system. Here’s some of the ones, you can have Tag Man, which Ensighten purchased. Google Tag Manager, they have a free version. Adobe has one. Tealium, BrightTag which became Signal. There’s some different solutions out there. What are the four major pain points? I talked about a couple of them. Based on the 93% of the Internet 100 Top Retailers, they didn’t have complete implementation of the tags. They might have a hundred thousand pages, but who’s the person who has to put that tag on every page if you don’t have tag management? 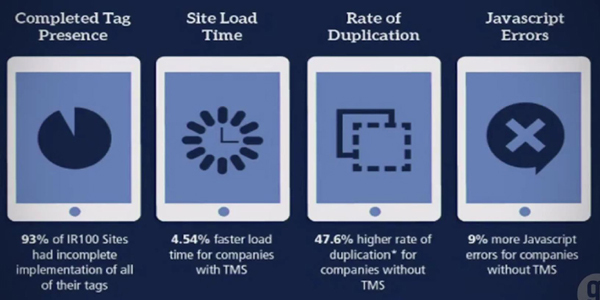 Speeding up your website, that’s important. Also, if you don’t complete tag presence on all your web pages, then you’re getting incomplete data. You’re not actually tracking all of your information. Incomplete data can be bad for you because then, you’re under-tracking information, then the data becomes wrong all over the place. Having a tag management system makes you more agile, makes you able to do stuff immediately and test cool stuff out. Good stuff. Let’s talk about data layer a little bit. This is interesting to me. I love looking at websites from the data layer perspective. Here’s AT&T, which is a top carrier in the states and what I see when I look at this site, here is that they’re using … It’s a very flat system here. It’s very flat screen. They’re not actually testing very much information. Everybody who comes to this site is pretty much getting the same experience. They do have some different stuff down here that they might be switching out, but it’s a very flat experience. They’re not doing a lot of testing, everybody is getting the same message. Conversely, here’s Staples which is an office supply store in the States. You could see here, they have all these different things popping through here, free shipping. All these different places where they can actually change the content based on the context of the customer who comes to your site. You want to be able to change the content based on the context of your visitor, I think that’s important. Here’s ESPN, a big sports channel in the States. 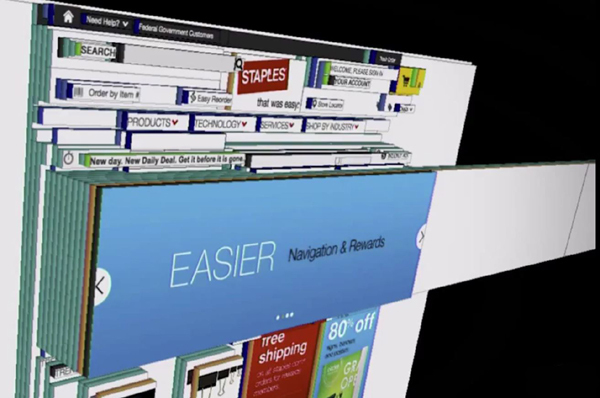 I think this is interesting because I look at it from a wireframe perspective. You can actually see all the different areas that can be flipped out and switched out based on the visitor. They can change all that stuff out which is pretty cool. Here’s Facebook. They have lots of different areas that they’re switching out on the fly all the time, which is pretty fascinating when you look at it from that perspective. What is a data layer? What does it do for you? It really is the life blood for your digital marketing and we’re here at a symposium, talking about data. This is actually my first symposium. I’ve spoken at many conferences but never a symposium. I feel so classy now. I need some wine with my symposium. Synchronise data definitions, you want to synchronise all that stuff, create one profile, and then be able to shift it off to all the different vendors, so they all have the exact duplicate copy of that. It’s good stuff. Standardise that, control that data, how you’re sending it to your partners, and then you have better visitor attribution. You’re able to determine where that came from, where that customer came from, what channel’s actually impacted them on the customer journey, did they actually purchase, and the path to conversion. Better insights. Here’s what it looks like. Before, you just have this regular data, you’re sending all your stuff all over the place but then you have a data layer, you’re able to collect it all, put it all in one place, shoot it all out in an organised fashion, and you’re also able to pull information back and keep building your data. You’re working with different people, you’re working with different companies, people have seen different ads and different places, you want to be able to collect all that, so then you can just keep building that customer profile. Before, this was very tough. You’re missing data, you didn’t have all the ad impressions, and you weren’t finding all the social interactions. All the stuff was kind of disjointed. Very tough to do. Now, you’re able to really improve that with data ownership. Here’s one thing that’s really crucial about this, so say you’re dealing with a double-click or you’re using a different ad network over here. Then you say, “You know what? I’m not going to use you anymore. I’m going to move over here to this other ad network.” Well, what typically happens here in the past is that you have to start all over and build profiles from the very beginning. It’s a big cumbersome pain. What’s important is for you to own your data and then when you move to a different ad network, you can just pick it up and go, “Here they are.” That’s way more effective for you in the long run because if you have to switch over, and you don’t do that, and you don’t own your data, well, it’s going to be a tough. It’s going to take you another three to six months to build that up, so you lose a lot of time and your competitors win a little bit. This right here is cowboys herding cats, which is the best gift ever. The point of this is do you really want to get on a conference call with your vendors and say, “Hey, can you send me over my data?” That’d be like “Yeah, I’ll get right on that” and they will not. I love this though here. At the end of a hard day of herding cats, you get your ball of yarn, and probably have a glass of milk. I don’t know what they do. I haven’t seen the rest of it, it just keeps looping. I don’t know what happens after they’re done with the yarn. It’s very frustrating. 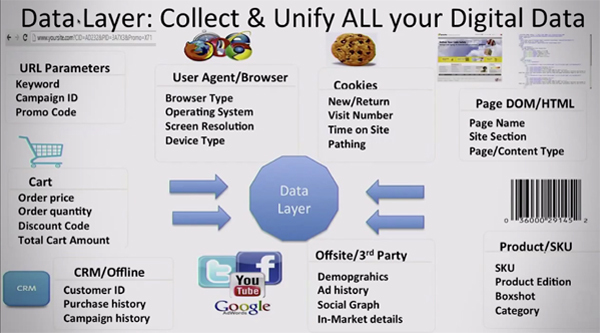 The data layer, collecting and unifying all of this data is important. You talk about, what keyword they used or what campaign? What was the promo code that they used? You know that information. What browser did they use? Everybody wants to know what browser they used. The cookies, where they’ve been before? Are they brand new? How long were they on this site? What was the path that they chose? There is so much cool stuff that you can do once you know a lot and build a lot of information on these visitor profiles. Then what’s awesome is you have this data layer and you have this unique profile that you can send everywhere. What’s cool, is you can send it back and forth. You’re collecting data, you’re sending data out, you’re continually building that user profile on that data, and it’s like being a mad data scientist. It’s massive. You have this awesome great information and it just keeps working. 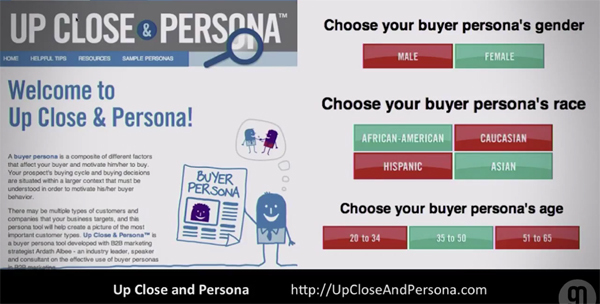 Marketing personas, people talk about that and knowing the customer. Some of this stuff is basic for the advanced people here in the room. 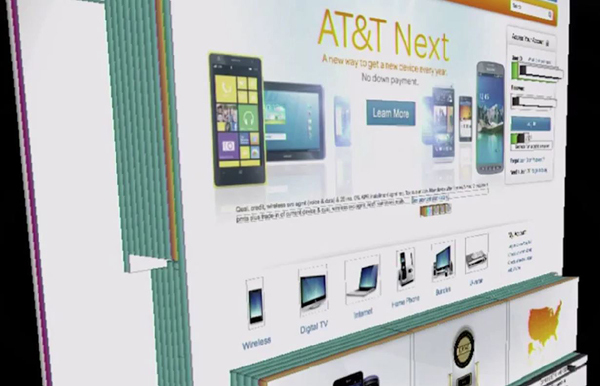 Forrester is calling this a trend, “The age of the customer” and that we need to be customer-obsessed moving forward. It’s not so much just to know your customer, we’ve got to be obsessed about the customer to really make sure that we’re giving them the best deals and giving them the right offers that work best for them. Knowing your customer is huge and if you’re in B2B marketing, these are maybe some things that you want to know about your potential prospect, doing some persona identification. Lots of different ways you can do that. I like to interview current customers to see what’s working with them and do some A/B testing, and really checking out the analytics. Here’s a cool tool, if you haven’t seen this if you want to do personas, it’s called “Up close and persona” It’s actually a WYSIWYG you can walk through and it takes about 10 to 15 minutes to really build out a persona but instead of avoiding it and saying, “Oh, I get the personas eventually,” you can literally do it in an afternoon. What’s their gender? What’s their race? What’s their age? Etc., etc., etc. This whole thing and it builds, “What’s their name?” “Her name is Nancy and she works in accounting.” You can build it all out, it’s pretty sweet. Another really cool thing, I really love is Graph Search. I’m a big fan of Facebook, and Facebook advertising, and micro-targeting. Never before in advertising could you be so granular with your targeting. You can literally target one person and advertise only to them. It is amazing what you can do on Facebook. Not only can you check out and say, “Hey, is there a plumber nearby?” Which you can, or say, “Hey, what’s the restaurants nearby?” You can or you could say, “Hey, who are my friends that live in Boston, Massachusetts” if you go to Boston, Massachusetts. I didn’t say Sydney, but I only had one friend in Sydney. Hopefully, I have more friends after I leave, right now. You can go through and see, you go “Oh, what percentage of them or what gender?” People who like Six Flags, 38% of them are dudes. 20% of them like Disneyland, probably because of Frozen, they’re tired of their kids singing it. They don’t want anything to do with Disney anymore. Another thing that’s really interesting is you can start looking at different things … like what kind of cars do people drive that like Disneyland? What kind of candies do they like, do they like Kit Kats, and Snickers, and M&M’s? You can really go through and find some cool correlations in the data where you can then advertise in different places that you might not normally advertise because people who like this, also like that. Really cool stuff. We literally found them, three employees that were nearly $400,000 in total salaries and it cost us $209 in advertising to find them. It’s crazy. If you understand Facebook, you can do some pretty awesome stuff. That’s a bro fist right there. That’s good. It’s a cat bro fist, that’s pretty rare. Next up, I’m going to talk … I live in Kansas city and our football team, not soccer, we have American football. My team is the Chiefs and they were really bad a couple of years ago. They weren’t spending nearly enough money on the team and I was very upset with that. I was talking with a friend of mine who I’ve had since fifth grade and he was like “Yeah, we are not spending nearly enough money” and I’m like “Yeah, I’m going to Tweet that,” so I tweeted this two years ago. I’m not much of a Chiefs fan anymore. Clark Hunt, he’s the owner. Yearly, 30 million dollars under the salary cap is unethical. That’s BS. I blurred that out for the dainty. They want too much. 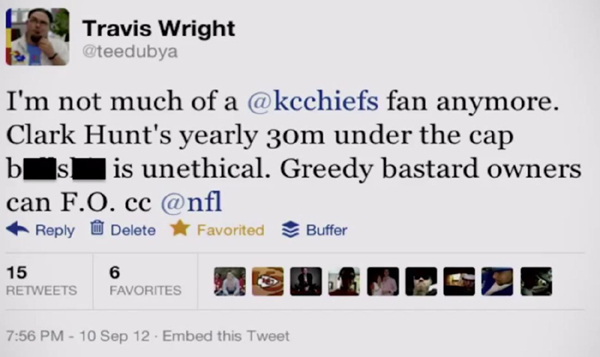 “Greedy owners can F.O.” I was very polite in this one Tweet. I was gentle, kind, I was angry. I’m a sports fan, I ranted, right? One Tweet, that’s all it was. I was done and I forgot about it. Notice the time, where’s the time? 7:56 PM. Three minutes later, the Chiefs guy messages me back and said, “Hey, it would help if you had your facts straight. It’s your choice to be a fan, CC get a clue.” He told me to get a clue. Wow. We have to watch this in its entirety because I was that surprised. I didn’t actually see it until the next day at lunch. This happened and then I’m eating my lunch and I was like “Wow, this is crazy.” I took a screen cap of it and I said, “Hey, it’s good to know the Chiefs’ social media team is run by a bunch of immature teenagers. Fact: you guys hoard money, blah, blah, blah” and I was mad. I was mad then. Once they blocked me, that’s when I said, “Ooh, you wouldn’t like a social media expert when he’s angry.” What did I do? I put it on Reddit. You guys know Reddit? It’s a really big social media site in the States. It’s a social news site, you get to customise your own news. It ended up making the front page of that site. I actually slowed it down and ended up crashing the site a little bit, which is crazy and made the front page of Yahoo. Mashable talked about it, ESPN talked about it, NFL talked about it. It was insane. I was on the news. “The Chiefs told you what? So rude.” I’m like “I know.” I was like “Wow, they told me to get a clue.” Someone had made a gif of me so I have a gif of myself on the news. Wow. Then they apologise which is very nice of them. Of course, I was blocked from them so I didn’t see it. I was too busy trending at the time, I was very proud of myself. That’s my little Twitter story there. Probably ought to make sure you know your customer, who you’re talking to. That was interesting. I did troll them a little bit by copying the NFL at the end of it. That was my bad on that, but it ended up being crazy. That’s my cool story. I love that collar. If anybody ever finds one of this in my size, please get it for me. I will reimburse you via Paypal. Now I want to tell you about something that worked out really well. I’m coming to Australia and actually, now I’m here. Before that, I was going to come here, and so I Tweeted about it and I was chatting with somebody. I said, “I really don’t know what I need to do about my phone and I’ve never been to Australia. Do they have T-Mobile there?” Kate, my friend was like “No, but they have Virgin, and Optus, and Telstra” and I said, “Okay. Cool. How is that work?” Or Telstra, I said it wrong. Telstra. Tesla, no? All right. They hooked me up with a little wifi device for the time that I’m here, and they gave me a bag of goodies. Ridiculous. They gave me beer, they gave me some Vegemite which I will not eat. I’m not going to eat that. They gave me some Tim Tams which look good. They say that I should dip it in my Vegemite, but that seems ridiculous. They hooked it up and it was amazing. I got some flip flops and they were just so friendly and nice. It was one of the best experiences that I’ve had with the brand across the country, across the pond. That was amazing, so big ups for Optus. Love that. That was crazy. Personalisation, that’s what they kind of did. 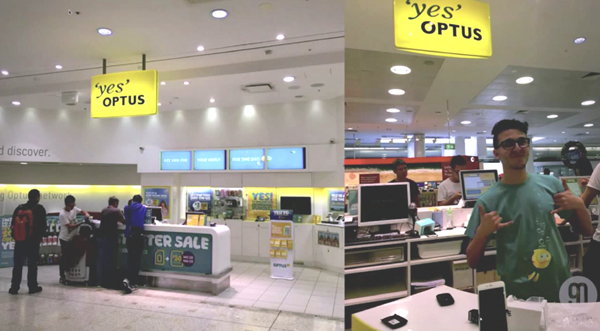 They said, “Hey, let’s connect this.” Now, are there any Optus people here? Are there any? I don’t know, I have a sneaking suspicion that they probably figured out I was speaking and maybe their boss was going to be here or something. In the next post, Data-driven marketing technologies and their role in modern marketing – part 3, Travis talks about the importance of personalisation and shares some cool tools marketers can use to help optimise their business relationships.